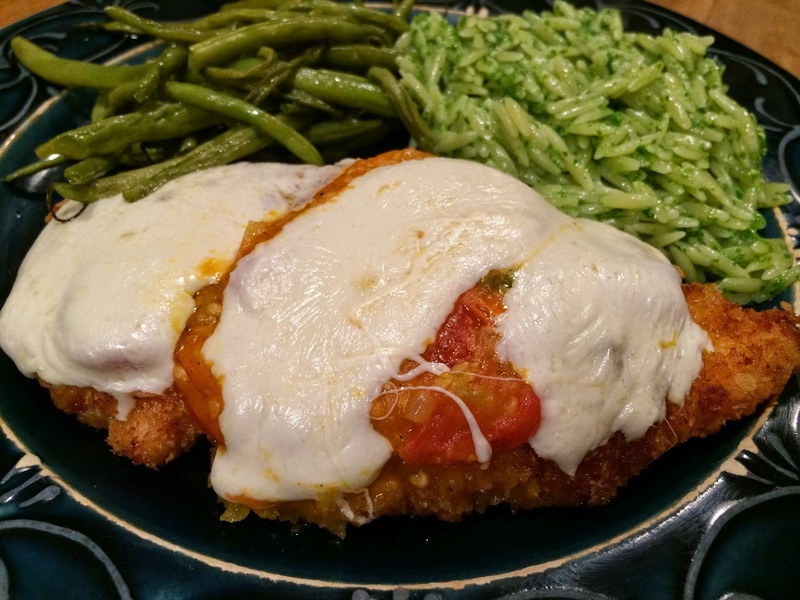 Chicken Parmesan is such a satisfying combination of flavors and textures, and this time of year it provides a great excuse to turn on your oven. Preheat your oven to 400 while heating about an 1/8 of an inch of olive oil in a large frying pan. Next, pound your boneless chicken breasts or tenders between a couple of sheets of saran to a ¼ inch thickness then liberally salt and pepper. For the breading add a cup of flour, three lightly beaten eggs with a splash of milk, and two cups of breadcrumbs or panko to three separate bowls. When your oil is hot individually dredge each piece of chicken in the flour, egg and breadcrumb mixtures in that order and fry on each side until golden, about three or four minutes. Lay them all out in a large baking dish and top with tomato sauce and sliced mozzarella and bake at 350 for fifteen minutes. Serve with pasta, in this case I did an orzo with basil pesto.